On February 17, 2013, our sweet Mattie Elizabeth Goble, who was just five years old, was diagnosed with DIPG (Diffuse Intrinsic Pontine Glioma), an inoperable, incurable brain stem tumor. 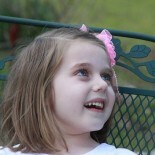 Mattie fought her battle with much grace and the utmost childlike faith in our Lord Jesus. On November 16, 2013, when Mattie was six-and-a-half years old, she completed her journey here on Earth and ran to the arms of Jesus. During the nine months we fought alongside our precious Mattie, we were constantly surrounded by friends, family, and even strangers who poured out their love and resources to support and encourage us. Through Mattie’s Mission, it is the deepest desire of our hearts to stand beside other families who are facing childhood cancer and provide for their financial, spiritual, and emotional needs. It is impossible to describe the feelings you face when you watch helplessly as your child struggles with an incurable disease, but through Mattie’s courageous battle we found hope and peace in Jesus Christ – a truly impossible gift without God. We want to share this gift and the gospel of our Lord Jesus with all who we come in contact with. DIPG affects the pons portion of the brainstem, rendering nervous system function impossible. Symptoms include double vision, inability to close the eyelids completely, dropping one side of the face, and difficulty chewing and swallowing. Unfortunately these symptoms usually worsen rapidly because the tumor is rapidly growing. A searchable blog on DIPG research, DIPG news, recent publications, DIPG Foundations, DIPG researchers, clinical trials, and other issues relating to Diffuse Intrinsic Pontine Tumors – both Diffuse Intrinsic Pontine Gliomas (DIPGs) and Atypical Pontine Lesions (APLs). We understand how overwhelming a diagnosis of diffuse intrinsic pontine glioma can be. Right now, you probably have a lot of questions. How dangerous is DIPG? What is the very best treatment? What do we do next? We’ve tried to provide some answers to those questions here, and our expert pediatric subspecialists can explain your child’s condition fully when you meet with us.